The testo 805 mini infrared thermometer is perfect anywhere needing a quick surface temperature check: for example, you can use it for food controls in supermarkets to record the temperature of incoming goods, or to scan entire refrigerated sections. However, it is not only in the food sector (industry and retail), but also in building services that the Testo infrared thermometer performs reliably. Its small size (80 mm long) makes the infrared thermometer particularly practical, fitting into any pocket and always on hand. Its 1:1 optics system means it is suitable for close-up temperature measurements. At the touch of a button, the Testo infrared thermometer measures the surface temperature of the object being measured without coming into contact with it. If you need to measure the temperature of entire pallets of goods or refrigerated sections you can use scan mode for continuous measurement. 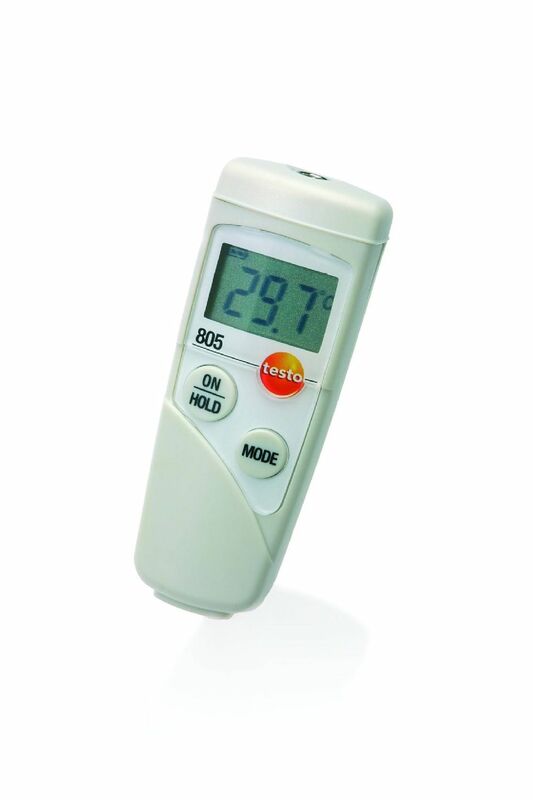 The scope of delivery of the testo 805 infrared thermometer includes the TopSafe protective case. This protects the measuring instrument from dirt and water in accordance with protection class IP 65. This protective case is of great benefit, e.g. in the food sector (e.g. food controls), where a humid environment and spray water can be expected. Testo 805 infrared thermometer, including TopSafe protective case and batteries.